So here we are again! 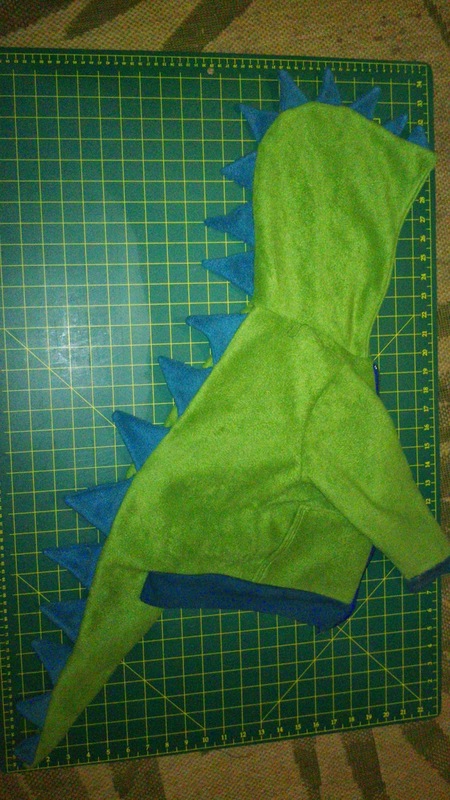 I thought this time I would talk about my sons favourite piece of clothing, the dinosaur hoodie. Mr 2 loves hoodies and is very excited by dinosaurs and dragons (I am planning to attempt a dragon hoodie variation later on). I have seen a number of dinosaur hoodies in the past, but mostly they are a commercially made hoodie with the spine ridges added later. I wanted to include a tail for dressing up, and decided the best way to do that was to start from scratch. To make my hoodie, I used the Kitchy Koo reversible zippy hoodie as a base pattern. This was a pattern that I had used before, and the lining conceals the insides of the spine ridges and stops things being stuffed in the tail! I used size 4 because he is quite a big boy (last check 94cm and 15.5kg) and I wanted to get the whole winter from it. · Scissors, pins, threads etc. 1) Select your hoodie pattern ensuring the hood has a centre seam and there is a ribbing band across the bottom. Trace your pattern pieces as normal. 2) Take the back pattern piece and lay it on top of another sheet of pattern paper. I prefer to use baking paper as it is cheap and readily available. You could also use butchers paper, pattern interfacing and even newspaper. It needs to be twice the length of the back piece. Trace the sides of the neck, shoulders, sides and bottom of the pattern piece. 3) Add seam allowance to the middle of the back piece. I use 1cm or 3/8". My back pattern piece was designed to be cut on the fold however it is easier to accurately add the spine ridge if it is separated. 4) Now we add the tail to the pattern piece. Measure the length of the centre of the back piece from the neckline to the base. For my pattern it was 14.5". Measure this distance from the bottom of the pattern and mark the paper. This is the length of the tail. This means that from the top of the pattern piece to the bottom of the tail is 29" (14.5" x 2). 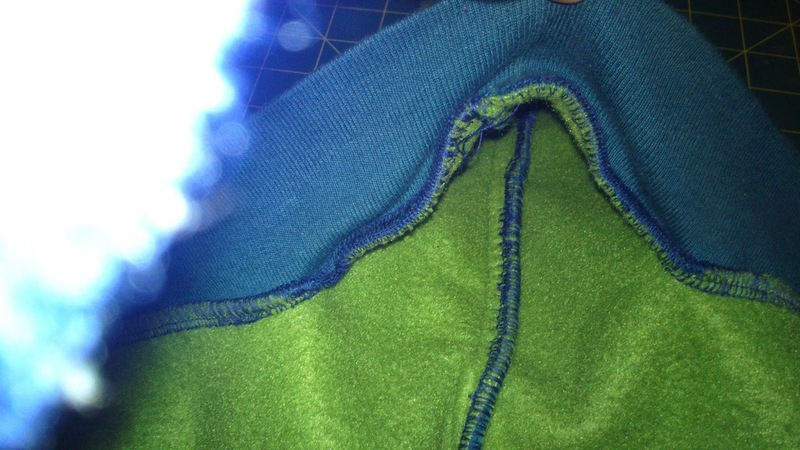 Extend the seam allowance line from the bottom of the hoodie. 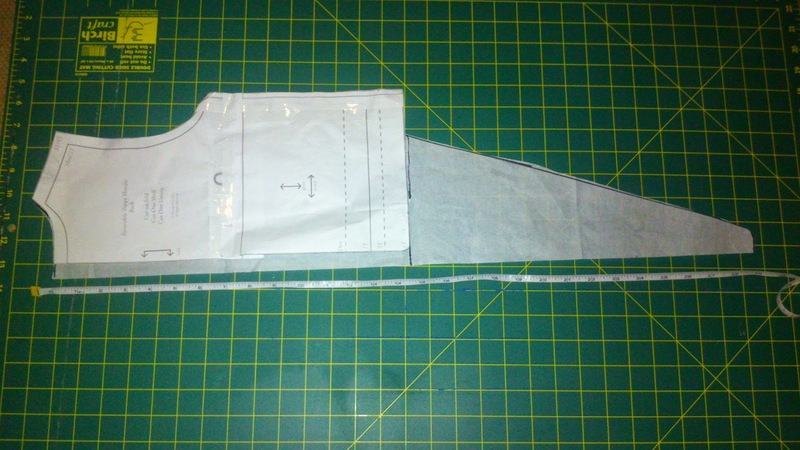 5) Measure the width of the back pattern piece. Divide the width into thirds and mark the thirds on the paper. Draw a line from the mark closest to the side of the hoodie to the end of the tail, curving inwards for the last 2", as pictured above. 6) Cut out your dinosaur tail pattern piece. When you reach the top of the tail, slice the pattern from the side to the third mark. This will allow the tail to be sewn into a tube. 7) Cut the fabric pieces. Cut 2 of your custom back/tail pattern pieces, mirrored. 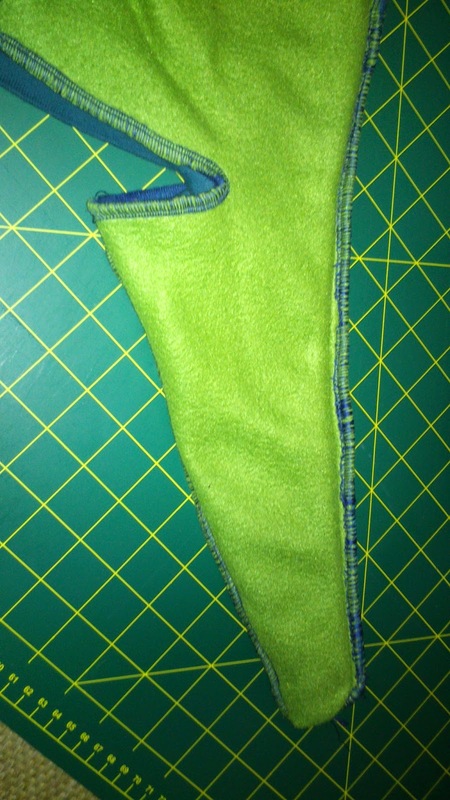 Cut 1 or 2 strips of contrasting polar fleece - 10cm or 4" wide by the width of fabric. I used one strip for a size 4. 8) Now we prepare the spine ridges. Fold strip one in half, selvage to selvage. Cut the strip into connecting triangles, as pictured. This will leave triangle shaped offcuts. Measure the length to 1" or 2.5cm less than the length of the back of the hoodie. You may wish to trim the ones closest to the end of the tail to be smaller than the ones on the back. Keep the offcuts! You will need them. 9) Ensure the strip of triangles is right side together, and sew along the tops of the triangle. Sew as close to the edge as you can. Sew the offcut triangles on 2 sides. 10) Trim the points and troughs in the spine ridge as shown to facilitate turning. 11) Turn the spine ridge and additional triangle so that the right side is out. 12) Take one of your back/tail pieces and lay it right side up. Starting 0.5 to 1" from the neckline, pin the spine ridge to the centre back, stopping 1-2" from the end of the tail. Baste to secure. 13) With right sides together, pin the two back/tail pieces together. The spine ridge should be sandwiched in between. Triple stitch the centre back together from the neckline to the end of the tail. 14) Ensuring you avoid the spine ridge, pin and sew the tail from the tip to the top of the tail. Turn the tail right way out. The tail should now form a tube with half connected to the back of the hoodie and half loose. 15) Take one of the fleece hood pieces and lay it right side up. Take the loose spine ridge pieces and leaving 0.5 to 1" clear at the front of the hood, place them evenly around the centre seam. I choose smaller ones for the front, gradually increasing towards where the hood will join to the back of the hood. Pin them in place and baste to the hood. 16) With right sides together, pin the two hood pieces together, sandwiching the ridge pieces between. Triple stitch the hood pieces together. 17) Assemble the hoodie as per the instructions in the pattern until you reach the ribbing band across the pattern. When attaching the ribbing, only sew the bottom half of the tail tube to the ribbing, as pictured. 18) Finish using the patterns instructions! Congratulations! You now have your own dinosaur hoodie.